agreements might constitute a solution to the impasse of WTO/DDA as well as a basis for future trade agreements within the WTO context. This policy article addresses the following questions: What are the different types of plurilateral agreements negotiated so far? How could a plurilateral perspective help solve the WTO/Doha Round impasse and contribute to strengthening of the multilateral trading system? Radical new approaches are urgently needed to reverse climate warming and to prevent the world from committing “ecocide” through environmental destruction. The radical new solutions proposed in this policy study go beyond the incremental change of current policy practice and instead suggest the need for a discontinuous change as the only means of halting the pervasive “tinkering along” approach of mainstream policy making which have not been able to bring about a halt to climate warming. This policy paper assesses the various attempts of state and non-state actors to cope with climate change and argues that a radically new approach is needed within the WTO agreements to generate solutions that have sufficient weight and treaty power to bring about a new and credible approach towards halting and reversing of climate warming. Building on previous analysis and recommendations, this policy study discusses the interface between multilateral agreements on trade and on climate change and suggests that the WTO is the only multilateral institution which can effectively generate legal constraints and political will to stop climate warming. This policy study proposes an intra-regime solution within the WTO agreement in order to elicit the green investments and green production needed to successfully implement climate change mitigation and adaptation. The following questions are addressed by this policy study: Which are the international economic governance options to effectively stop climate warming? Which are the main disciplines within the WTO Agreements addressing environment, trade, investment and intellectual property? What can be changed within the WTO Agreements to foster a green economy in developed and developing countries? What does the WTO case law say about disputes involving environment, trade, and investment? Tourism is a significant contributor to GDP, employment and to the international appreciation of a country and its culture – regardless of its level of development. This policy analysis seeks to assist the Least Developed Countries (LDCs) in harnessing development opportunities by providing a comprehensive overview of existing international development instruments, i.e., Diagnostic Trade Integration Studies (DTISs) and their Action Matrices, Poverty Reduction Strategy Papers (PRSPs), and reviewing their alignment with the national tourism development strategies, investment policies and tourism related trade arrangements. The authors encourage the use of findings from this analysis by all actors and stakeholders engaged with trade facilitation activities in LDCs. In reviewing these key development policy documents, this in-depth analysis seeks to better equip LDCs to manage international policy advice provided by a multitude of international development partners. The ultimate objective of this work is to support their achievement of greater social and economic benefits through growth trade in tourism services. 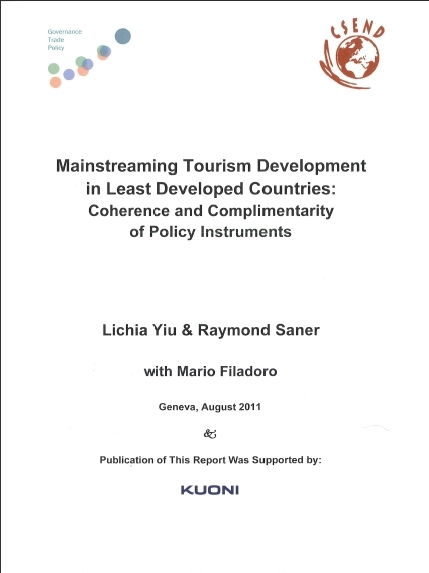 It is also hoped that this analytical report will enhance the coherence and complimentarity of tourism development advice proposed by the international community via drawing attention to policy gaps and implementation vacuums existing within the tourism supply and value chain. Le système qui régit l'entrée des travailleurs étrangers en Suisse répond de manière insuffisante voire inappropriée à la demande de main d'œuvre dans de nombreux secteurs. Avec le problème imminent du vieillissement de la population, des solutions efficaces doivent permettre à la Suisse de maintenir sa main d'œuvre à flot. Le recours à des travailleurs de pays tiers devient dès lors l'une des seules solutions efficaces pour éviter un lent démantèlement de l'économie suisse. Cet article révèle les dysfonctionnements de la politique économique d'immigration suisse et ébauche pour les politiques publiques un système de migration circulaire fiable pour les travailleurs semi-qualifiés qui, dans un esprit de bénéfice mutuel, contribuerait substantiellement à la bonne santé du marché du travail en Suisse, tout en offrant un appui crucial au développement du pays d'origine des travailleurs et à l'épanouissement des travailleurs eux-mêmes.